Sitting atop short legs, the Minskin is named for its miniature size and soft-as-cashmere sparsely coated skin, highlighted by short, soft fur “points” on the extremities: face, ears, legs and tail. The cat can be found in all colors and patterns, including solids, tortoiseshells, tabby patterns, and colors with white. Colorpoints are popular. The Minskin’s body is described as semi-cobby, being noticeably stocky and small. The cat has a rounded head with large round eyes and a sweet expression. Minskins retain a kittenlike appearance into adulthood. People with cold or arthritic hands. Outgoing and playful, this feline sweetie loves people and enjoys being handled. Expect it to love being in a lap. Like any other cat, the Minskin is active and enjoys high places. It might be vertically challenged when it comes to height, but it can still climb with the best of them. The Minskin is everyone’s friend and gets along well with dogs, other cats and children. This cat carries its share of the feline hunting gene and likes toys it can chase, especially if feathers are involved. One of the best things about the Minskin is that it’s warm to the touch, making it a pleasure to cuddle with on a cold night. The Minskin is generally healthy. The Minskin’s minimal coat is nonshedding and easy to groom. Regular bathing with mild shampoo is necessary to keep the skin supple and healthy. The Minskin is a rare breed and may be difficult to find. The Minskin is only a decade old. 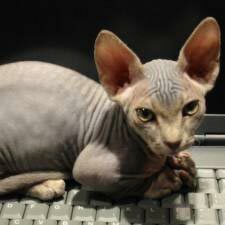 It began to be developed in Boston in 1998 by breeder Paul McSorley, who achieved the look and personality he wanted by crossing the Sphynx and the Munchkin. By 2000, he had produced the first standard Minskin, and by 2005 more than 50 were in existence, as well as variants that had long legs and full coats. The breed is seeking recognition from The International Cat Association (TICA).